An earlier version of this story incorrectly identified principal violinist Jun Zhu as the performer of the fiddle solo in “Fiddle-Faddle” when the solo was actually performed by ARC Orchestra’s concertmaster Bolormaa Damdinjav. 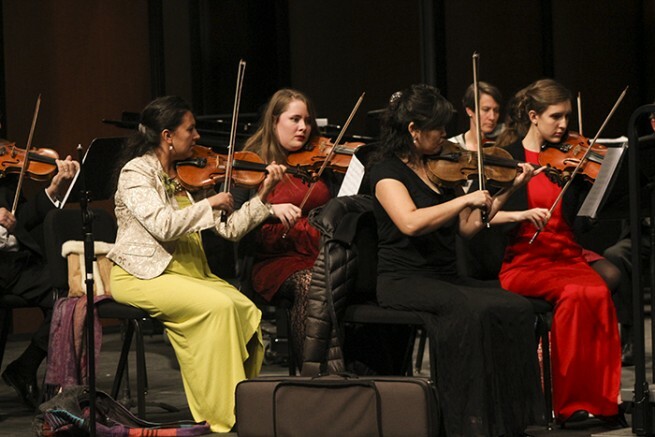 The American River College orchestra performed a variety of holiday music on Wednesday night in the main theater. The orchestra performed selections from plays, movie soundtracks and more traditional songs. The first piece that the orchestra performed was Leroy Anderson’s “Sleigh Ride,” complete with jingle bells and a trumpet imitating the sound of a reindeer. The tempo was not very fast, but the groove was steady, especially when the jazz sections of the song were played with the drums in the background. “A Medley for Orchestra” was based on the works of the late Duke Ellington, who composed and collaborated with many famous artists, such as Ella Fitzgerald and Frank Sinatra. Many different musical styles are explored in this piece from very fast and loud sections to soft, whimsical sections. The pieces are a little slower, and the music is a little more serious in contrast to the previous songs. Next up was a Leroy Anderson piece in “Fiddle-Faddle,” with the titular fiddle solo performed by ARC Orchestra’s concertmaster Bolormaa Damdinjav. The song is akin to an old Western song that would be played in a tavern. The next piece was a medley of different songs from the James Bond film series, arranged by Victor Lopez. The recognizable waltz known as “The Blue Danube” was showcased as well. Bass Trombonist Ian Ellis said the waltz is his favorite piece in the set. “A busy brass part that is uncommon in most other orchestra type pieces. It changed my opinion on orchestra as a whole,” said Ellis. The last piece of the evening was the Radetzky March by Johann Strauss. Thompson involved the audience by asking them to clap along with the song. The ensemble will perform one more time on Dec. 9 at the Gibbons Park Community Center at 7 p.m.
Be the first to comment on "Orchestra performed variety of holiday music"